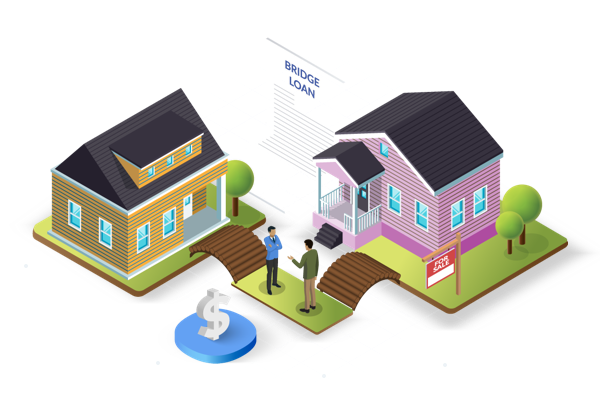 What is a Home Bridge Loan? While home bridge loans can be costly and somewhat risky, when used correctly they can make buying a new home a lot easier. A Home bridge loan is a temporary loan to cover the expense of buying a residence while waiting for other forms of financing. The most common use of a home bridge loan so a borrower can make the down payment on a new home while they are still waiting to sell their current home. However, it is also occasionally used to buy a residence while waiting for a form of financing that is a slower process, or when then borrower plans to sell or refinance a home after quickly renovating it. Ideally, a borrower should simply wait to secure the sale of their home before getting the mortgage for another home, as that is much more cost-effective. However, we do not live in an ideal world, and sometimes an opportunity comes up that needs to be acted upon. If you are in a situation with a time sensitive purchase, it is best to get well informed before you proceed, so we’ve gathered together the most important info for you. There are three aspects to the cost of a home bridge loan. Like most loans, there is an annual interest rate. Typically the interest rates on bridge loans range between prime and prime +2, depending on various factors like your credit score and the value of your current home. The interest rates for bridge loans tend to be a bit higher than they would be for a conventional loan taken out by the same borrower. However, since bridge loans are usually smaller and much more short-term, the interest does not add up to much (some bridge loans will waive interest fees if the loan is paid back in under four months). Also common to both bridge loans and conventional loans is a series of administrative fees, for things like appraisal, and title policy. These fees are usually flat rates and are roughly the same for all bridge loans given out by the same lender independent of the size of the loan. While different lenders have different fees, a typical range for the flat fees on a home bridge loan is between $2000 and $3000. While the interest fees become less significant with short-term loans, these one-time fees become more significant; $3000 is a small amount of money over thirty years, but a significant amount of money over six months. The third cost of a home bridge loan isn’t commonly found in conventional loans: a loan origination fee. This is another one time fee, paid at the end of the loan, which usually ranges from 1% to 2% of the borrowed amount. This fee and the other one time fees work together to make bridge loans quite costly for the amount of time they are held for. Since the majority of bridge loans are paid for by the sale of a home, the likelihood that that home will sell is the primary factor that lenders use to determine the risk of the loan. That being said most lenders will not give bridge loans to borrowers with credit scores less than 650. While most lenders ask for a credit score of at least 650, other lenders place more emphasis on the value of the home that is being sold. Some lenders only ask for a credit score of 550, and there are others who do not check your credit at all. Remember, the lower the credit standards, the more costly the loan. Be wary of any lender that doesn’t ask for a credit check; many of lenders who don't ask for credit checks are predatory. A home equity loan can serve the same function as a bridge loan: a means to get funds to make a down payment before you sell your first home. A home equity loan works in a bit of a different way though. The value of your home is reassessed and then the bank can grant a loan based on the difference between that reassessment and the amount that you currently owe. If it is an option, a home equity loan will be more cost-effective than a residence bridge loan. However, there are some limitations to a home equity loan that a bridge loan avoids. The processing time for a home equity loan is significantly longer than it is for a bridge loan, so there are occasions in which funding is needed quickly, and a bridge loan is the best option. Also, home equity loans can only be for a percentage of the equity on the first home. Sometimes this equity is not enough to cover the down payment on the new mortgage so that a bridge loan would be necessary. Whether a HEL or a different bridge loan is your best option really depends on your circumstance. Doing lots of research on the difference options can go a long way in making the right choice, and if you still have doubt, talking to an expert on the subject can help you be sure about your decision.